Lynn Olson and her granddaughter Siri have more in common than just a last name. Both are passionate about helping others, and volunteering at Mayo gives them the opportunity to do that. 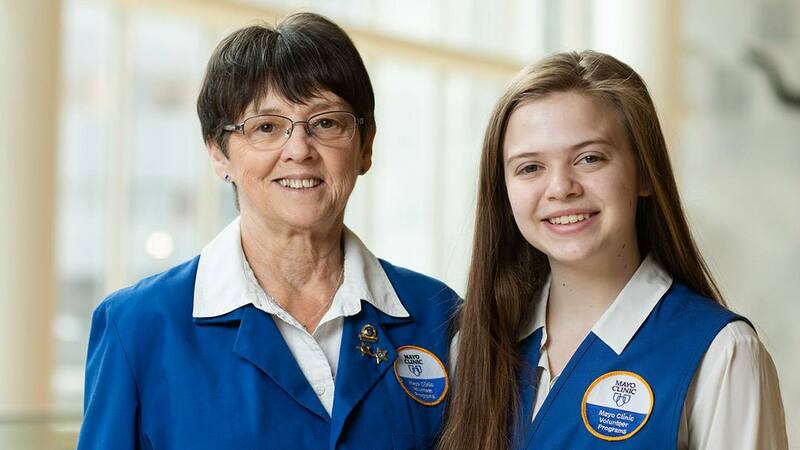 Lynn Olson recalls how she felt when she found out her granddaughter Siri Olson had made the cut to become one of Mayo Clinic's newest and youngest volunteers. "One of our Volunteer Services managers said they'd had a lot of candidates, and only select so many for the program, but Siri was one of them," Lynn tells us. "I thought that was awesome because I knew she'd be so excited." Days before, Siri had to convince Becky Hynes and Mayo Clinic's other Volunteer Services managers she had what it takes to don the coveted blue volunteer vest. Hynes tells us Mayo Clinic's Young Volunteers program provides volunteer opportunities to young adults like Siri in both clinical and hospital settings. "The program is open to middle and high school students who are currently 14 or older," Hynes says. "These students commit to a minimum of one year of service." Mayo's Young Volunteers serve in more than 20 areas across the Rochester campus, Hynes tells us. "Those who are accepted into this highly competitive program receive an opportunity to gain volunteer experience, acquire exposure to the medical setting, and become immersed into Mayo Clinic's values and culture." For Siri, whose "kind, compassionate and caring" nature, we're told, helped her sail through the interview process, there's been one more perk to coming on board as a Mayo volunteer earlier this year: the unique opportunity to be shown the ropes by her grandmother. Lynn has been donning the blue jacket (worn by the more seasoned volunteers) since 2015 after retiring from a 31-year career at Mayo Clinic. "Siri was going to do wayfinding like me, so our managers asked if I'd be interested in training her," Lynn tells us. "I thought that would be such a fun thing to do — to have my granddaughter with me and to show her where everything is around Mayo Clinic." And fun it was, Lynn tells us. "They took a picture of us wearing our blue jacket and vest, and it was kind of like we were twinning," she says. "It was just such a cool experience and such a great opportunity for Siri to do the same kind of work I enjoy doing myself. I was so honored and so proud to be able to train her and to have her be mature and caring enough to want to become a volunteer and help share Mayo Clinic's values by helping other people." And once her training was done, it was time for Siri to do just that. "I tend to travel around campus a lot during my shifts," Siri tells us. "I also like to head toward the parking ramps in the Gonda Building to see if I can find anyone who needs help at the end of the day." What she's found, Siri tells us, are not only patients who need help finding their way, but also an appreciation for what's brought them to Mayo. "Some of the things patients are going through are really hard to imagine," Siri says. "Knowing that we as volunteers can do something to help them through that makes you feel good." We think it'd also be just awesome if you volunteered your comments below before using the handy social media tools to share this story with others. Consider becoming a Mayo Clinic volunteer.